I've always loved PHPMyAdmin for managing MySQL databases. It's Web-based, fairly robust and as powerful as I've ever needed. Basically, it's awesome. Today, however, I discovered something better than awesome: Adminer. 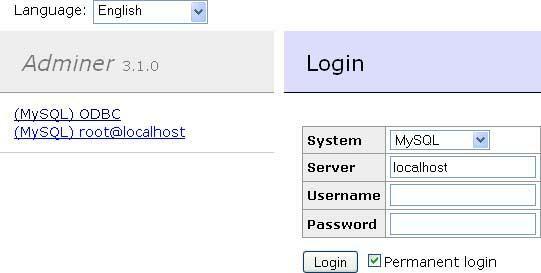 Although it is conceptually identical to PHPMyAdmin, it is far simpler and far more powerful. How can it be both? The Adminer Web site has a great feature comparison: http://www.adminer.org/en/phpmyadmin. For me, the interface is basic, no-nonsense and intuitive. I like that installation is a single PHP file, and I also like that it supports alternate database systems like Postgres. If you are someone who prefers to use a Web interface over the command line, don't be ashamed. Heck, I recently managed an entire database department at a university, and I still prefer a Web-based interface. Anyway, if you're like me, you'll love Adminer. Get your copy today at http://www.adminer.org.